While residents of Paradise, California fled down freeways choked with ash and hollowed-out cars, Kim Kardashian and Kanye West rested easy this week. Like many wealthy Californians, the ultrarich couple hired a private firefighting force to protect their $60 million mansion from the devastating wildfires, which have left at least 56 people dead. The rich have been recusing themselves from wildfires for years. Since the early 2000s, insurance companies like Chubb and AIG have dispatched for-profit fire brigades to safeguard the property of their wealthy clients. Customers pay up to $100,000 for these services, which usually include a hotel stay in addition to bespoke fire protection. Meanwhile, the need for such protection is growing. Thanks to urban sprawl and climate change caused by fossil fuel emissions, fire seasons are growing longer and more violent. For private firefighters, business is booming. Welcome to our climate future: disasters will get worse, and the rich will pay to sit them out. Meanwhile, public investment in fire management has stalled, and federal funding for disaster relief has plummeted. What’s more, the Trump administration refuses to acknowledge, much less prepare for, the warming scientists say will begin to wreak havoc on the planet by 2040. Climate change already mostly affects the poor — a truth underscored by disasters from Hurricane Maria to the ongoing famine in West Africa. And wealth inequality is sure to determine who suffers in a hotter, more dangerous, and less predictable world. When it comes to fires, this future may look a lot like the past. 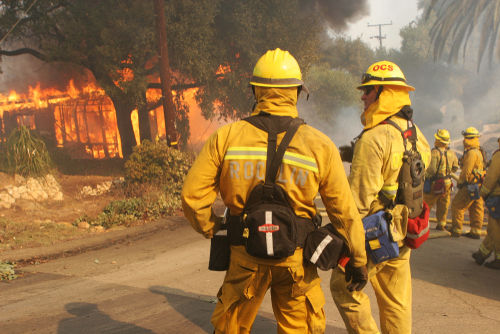 The U.S. has considered firefighting a public good since the mid-19th century. Before that, cities relied on a disastrous model imported from Europe: private fire brigades backed by insurance companies responded to blazes threatening paying customers, leaving some uninsured homes to burn, according to historians. In some places, plaques over doorways indicated which fire service a resident subscribed to. Fire protection, like education and clean water, is now generally considered a public good. These services benefit everyone, and reflect the principle that every person has a right to basic safety. But since the Reagan era, the U.S. has aggressively moved to privatize public services: education, healthcare, water, prisons, fire protection, and more. Recent natural disasters have made the impact of these reforms apparent: When things go wrong, the wealthy can pay to make them right, while others suffer. During Hurricane Katrina, which disproportionately affected black residents, rich New Orleanians hired private security guards from companies like Blackwater to guard their homes. After Hurricane Maria, which cut Puerto Rico’s power for nearly a year, wealthy islanders who didn’t flee bought expensive generators to keep their lights on. Public investment in environmental management is desperately needed to protect the most vulnerable — now more than ever. As California’s wildfires get worse, they’re also getting more expensive to fight. California burned through nearly all of its 2018 firefighting funds battling blazes in September, leaving it cash-strapped going into the Camp and Woolsey fires. California has been fairly proactive in its efforts to prevent and manage fires, but the federal government, which manages 40 percent of the state’s land, has not. The budget for the U.S. Forest Service, which manages wildfires on federal land, has flatlined. For years, the Forest Service has siphoned fundsfrom other parts of its budget, including from forest management programs designed to prevent wildfires before they happen. While the so-called fire funding fix included in Congress’ omnibus spending package throws more federal money at fire suppression, the 2019 federal budget cuts funding for crucial fire prevention research. Adding to the pressure, President Trump threatened in a tweet last week to halt federal payments to help fight California’s blazes, putting more pressure on private fire services. Trump has made gutting environmental protections a centerpiece of his presidency. The Environmental Protection Agency and the U.S. Department of the Interior, stuffed with climate deniers, have rolled back regulations to protect the environment and human health. And the Congressional spending bill still allocates zero dollars to climate change adaptation efforts organized by the United Nations. This is a deadly mistake. The most recent report from the Intergovernmental Panel on Climate Change predicts the most dangerous consequences of global warming — dramatic sea-level rise, drought, more devastating storms — could arrive within three decades if governments fail to slash carbon emissions. If the U.S. continues to do nothing, not only will more people have to ditch California towns, but 2.5 million will be forced to flee Florida by 2100, according to demographers at the University of Georgia. As Alexander Kaufman reported for HuffPost, Trump’s deployment of the military to stop migrants at the U.S.-Mexico border portends a future in which wealthy countries pony up to keep the poor and vulnerable out of bunkered communities. This is likely to happen in wealthy enclaves at every level — from national governments to gated neighborhoods. Kim and Kanye aren’t the first ultrarich Americans to buy their way out of disaster. Nor will they be the last. Yet, climate change, now more than ever, puts a moral obligation on governments to protect their most vulnerable residents, and it demands public investment in disaster protection and relief. Some in the newly elected Congress are pushing for a Green New Deal to dramatically increase investment in renewable energies and preparations for climate change. But the trend lines point in the opposite direction — toward a world in which the rich recuse themselves from disaster, while the poor, from Puerto Rico to Paradise, are left to die.